if not, the reasons therefor and the details of other alternatives, if any, proposed by the Government in this regard? (a) No, Madam. No such proposal is under consideration of Government. The revised Time Related Continuity Allowance (TRCA) as per the new TRCA matrix have been brought into effect with effect from 01.07.2018 after combining of different TRCA slabs viz 3 (three) hours, 3′ (three and half) hours and 3 hours and 45 minutes (three hours and forty five minutes) to four hours, while four and a half hours has been merged with five hours. Since the revised TRCA is based on increased minimum working hours, which takes prospective effect, hence retrospective revision of enhanced working hours is not possible. & (d) No, Madam. The Gramin Dak Sevaks are holders of civil post, though such posts are outside the regular civil services. 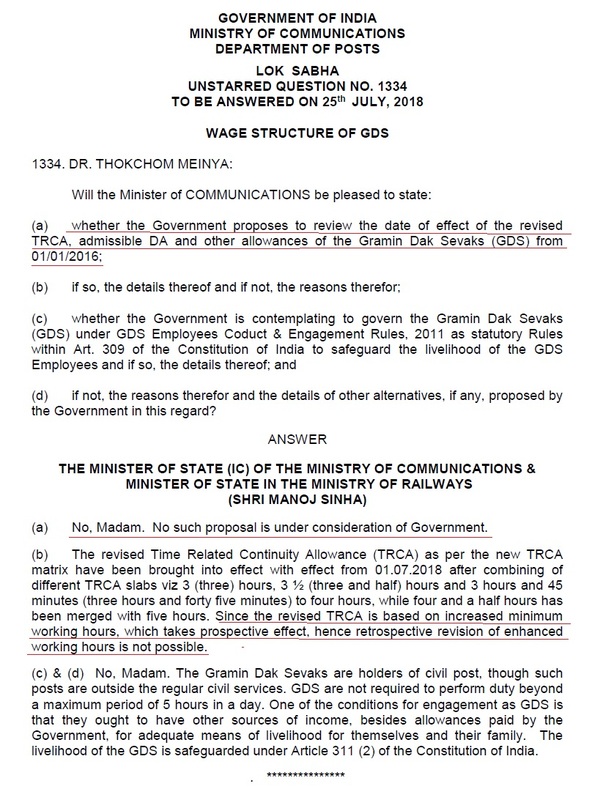 GDS are not required to perform duty beyond a maximum period of 5 hours in a day. One of the conditions for engagement as GDS is that they ought to have other sources of income, besides allowances paid by the Government, for adequate means of livelihood for themselves and their family. The livelihood of the GDS is safeguarded under Article 311 (2) of the Constitution of India.